Property 10: Bed and Breakfast "Normande"
Property 11: Quiet, rest, relaxation assured. 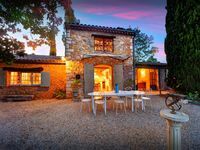 Property 16: Beautiful Farmhouse built on 8 000m2 in a dominant position in the Massif des Maures. RARE !!! Provencal cabins with swimming pool on 15 000 m2 of olive trees !!! Property 19: RARE !!! Provencal cabins with swimming pool on 15 000 m2 of olive trees !!! Big and beautiful villa 12 people, trees and flowers on 5400m2. Property 25: Big and beautiful villa 12 people, trees and flowers on 5400m2. Between vineyards and forests in a 15000m2 park. Property 36: Between vineyards and forests in a 15000m2 park. The best place to relax ! A beautiful home and lovely surroundings, including the pool, gardens (so many places just to sit and enjoy the views). If you are looking for a relaxed, family break - this is the place!